He Was Born To Rule The People Of God....But Yahweh Is Only A Vague, Powerless Memory In The Minds Of His People. Though born the second son of King Ahaz, Hezekiah is not protected from his father's perverted attempts to gain the favor of the idol Molech. Terrified and powerless at the foot of Molech's altar, Hezekiah encounters for the first time the one true God of his royal ancestry, Yahweh. But his journey to the Holy One is riddled by influence from an assortment of men: Zechariah, a grandfather of noble standing who has fallen into drunkenness; Uriah, the High Priest whose lust for power forces him to gamble the faith he proclaims; and Shebna, the Egyptian intellectual who guides Hezekiah's instruction. For the two women who love Hezekiah, the meaning of love--and its sacrificial essence--will direct the course of their lives and help shape the young prince's future. 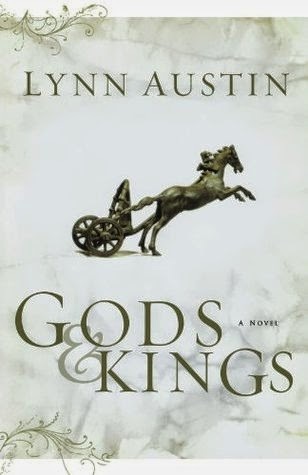 I have for a while been hearing rave reviews over Gods & Kings. I bought the first and second book in this series. I always love having the second book on hand if I end up liking the first one. After having it sit a couple of months or so on my shelf waiting for a time to open up and read it, I had a window and grabbed it. It ended up surpassing anything I had thought it could be! I was reintroduced to Lynn Austin's books this past year when I read her newest book, Return to Me (fabulous!). She has such a gift to capture you up into the story. She brings the past back to life and lets you not only see through her writing but feel it as well. The atrocities that have happened in the past, it is dumbfounding. I've read some of these accounts she set her story around in Bible studies, but to have it as a background to a story and seeing and feeling what the character's felt makes it more real and understandable. Hezekiah has a nightmarish life. He watches as two of his brothers are burned alive by their father as a sacrifice. That alone can traumatize you for life, but that isn't all he has to endure in his life. His father only seeks his own pleasure in life, not caring about anyone of anything, only what his greatness will be. In doing so, he takes Hezekiah mother from him and keeps his rock of a grandfather form him as well. However, before the separations, Hezekiah is introduced to the way of Yahweh, it leaves an impression on him. It helps him to see who his father the king really is, and why he doesn't want to be like him. Hezekiah's life is a battle, but one that holds great promise, despite the fact that he doesn't have much say over any of it as long as he is under the control of his father. It was also intriguing to see some of the great prophets in the story. We see Isaiah and Micah. Many of us know of Isaiah and his prophecy of the coming Savior, it was used here in this story. The way that the words of Isaiah and Micah were weaved through this story was beautifully done. It has made me want to go see out these passages and to read them again. I couldn't put this book down and as soon as I finished it, I picked the second book in the Chronicles of Kings series up.